Best first: Q: Where do pirates put their weapons? 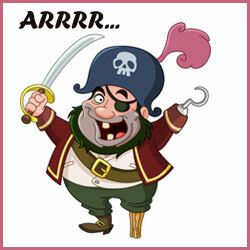 Q: How did the pirate get his Jolly Roger so cheaply? A: He bought it on sail. - Oh you make my Roger Jolly! But aye to aye is always best. Q: How does a pirate get to the top of the building? A: P. because it would be an R, but it’s missing a leg. Q: What would you call a pirate with 4 eyes? Q: What is a pirate’s favorite movie? A: He got burned to the ground. Q: Where do pirates put their weapons?